From 1901, Sousa's Band plays Sousa's own Stars and Stripes Forever March. Announcement "The Stars and Stripes Forever March, played by Sousa's Band for the Columbia Phonograph Company." Enjoy this early 20th Century performance of Sousa's great march recorded on a Columbia Phonograph Company 5-inch diameter "grand" wax cylinder (Edison's National Phonograph Company called their 5" records "concert" cylinders). Although they played just as long as the standard-sized wax cylinders of the era, the grand format was able to play back with greater sound volume. John Philip Sousa (1854-1932) led the United States Marine Band from 1880-1892, after which he went "pro"  forming his own band for touring engagements and to make recordings. 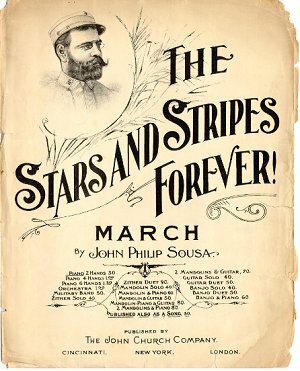 Sousa said the inspiration for the Stars and Stripes Forever came to him while he was returning to the USA in late 1896. It quickly became a national hit, being the Sousa Band's most frequently requested selection, and today is, in fact, the official march of the United States. To hear a banjo version of the Stars and Stripes Forever, see the July 1997 Cylinder of the Month. To hear a recording by the United States Marine Band from the period when Sousa was its director, see the September 1999 Cylinder of the Month.